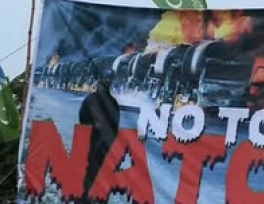 NATO trucks carrying supplies to Afghanistan were attacked in Pakistan on Tuesday following ongoing protests and anger in Pakistan over the July 3 reopening of the NATO supply routes and continued U.S. drone strikes which have escalated since May. The attack on the trucks took place in the northwest area near Peshawar and are said to be the first such attack since the supply routes have been reopened following a tepid apology from Secretary Clinton. Local administration official Bakhtiar Khan explained the attack to Agence-France Presse: "Two armed men riding on a motorbike opened fire on a container carrying supplies for NATO troops across the border and killed its driver." Though no one has taken responsibility for the attacks at this time, the Los Angeles Times reports that "Pakistani Taliban militants had warned that they would begin launching attacks on the convoys." 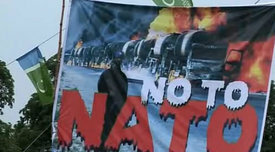 The attack on the NATO convoy comes a day after U.S. drones fired missiles killing at least 9 in northwest Pakistan. Democracy Now! reports that "Pakistani officials say the victims were suspected militants, but the Obama administration’s policy is to deem all adult-male drone targets as militants unless exculpatory evidence emerges after their deaths."